In the coming weeks and months, we will be getting up close and fursonal with each of the Pitties featured in our 2012 Pit Bull Frogs Calendar. The original plan was to introduce them by month as they are featured in the calendar. Then we decided to introduce them alphabetically. As with most of the plans related to producing this fun calendar, we changed our minds yet again. But, we have a really good reason! 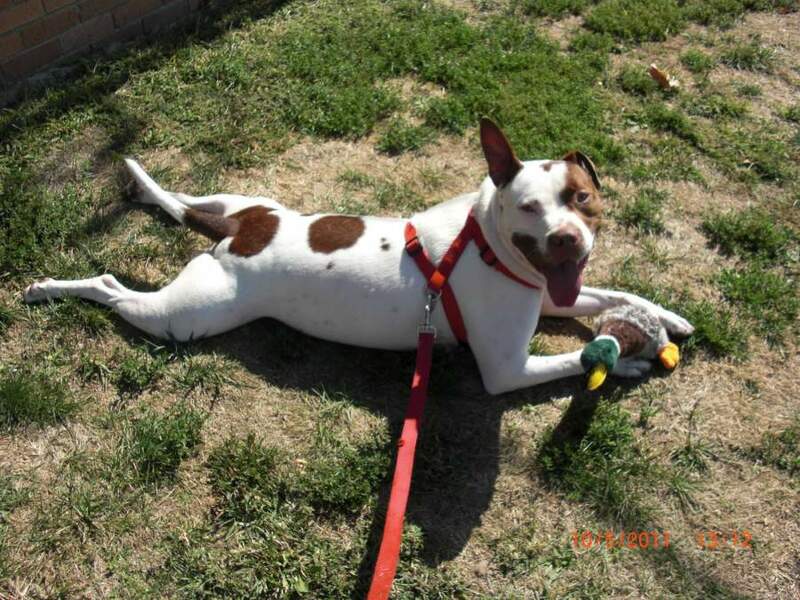 We're introducing you to Cane today because he is a shelter dog and needs a home and we would like to help. 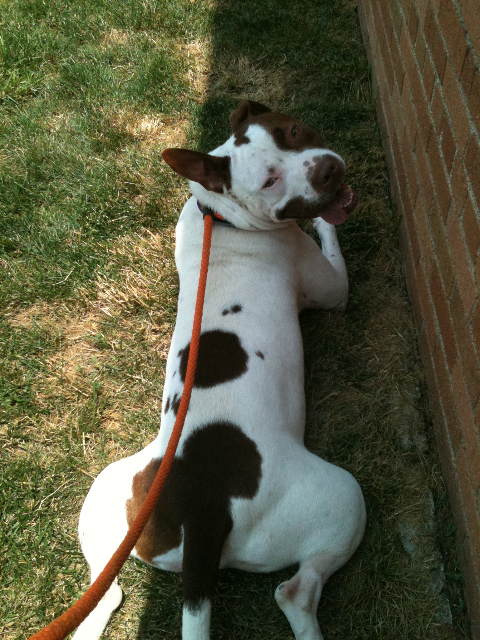 Cane's frog pose photo was submitted by a wonderfully dedicated volunteer at the shelter where he's hanging out, being adorabull and waiting for his forever family to come and take him home! Cane came to Stray Rescue of St. Louis with his girlfriend Cocoa (who has been adopted). Cane's coloring looks like he was an all-white dog that rubbed against Cocoa and got some of her brown on his white! BOL! 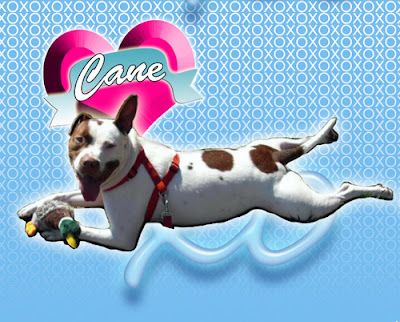 Cane loves to play and is tolerant of just about anything - being sprayed with the hose, being cajoled into the kiddie pool, being covered with a sheet and finding his way out. He loves his toys and usually takes one out of the toy box on his way for a walk. He's also content to just plop down in shady spot on the grass and chill with you and a toy by his side. Cane is a very sweet boy who loves to give kisses and has the most adorable ears with one up and one down all the time, adding to his already considerable charm! 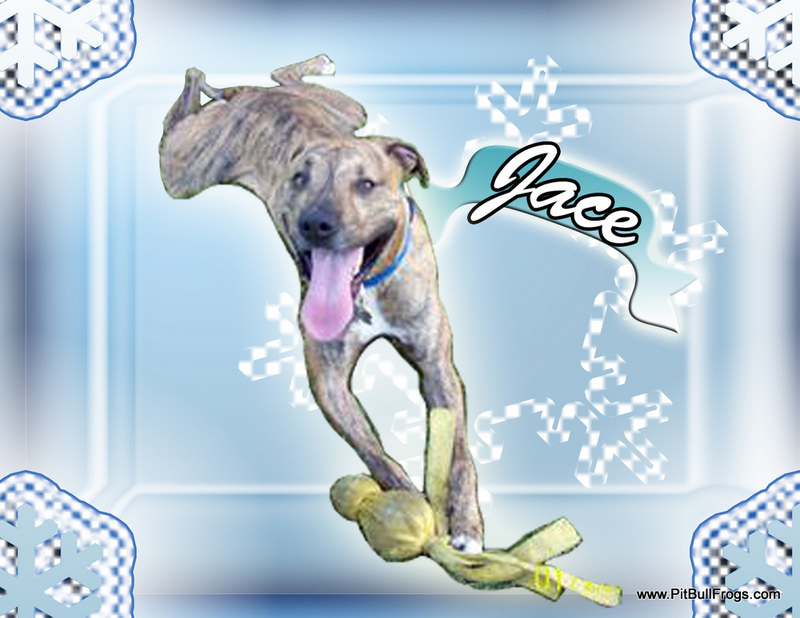 We would love to help Cane find his forever family. 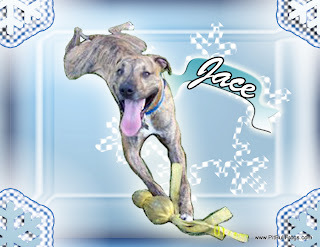 He would probably do best as an only dog, at least until he's settled and comfortable with his new family. You can find out more about Cane and apply to adopt him through his webpage at Stray Rescue of St. Louis here http://strayrescue.org/adopt/cane. 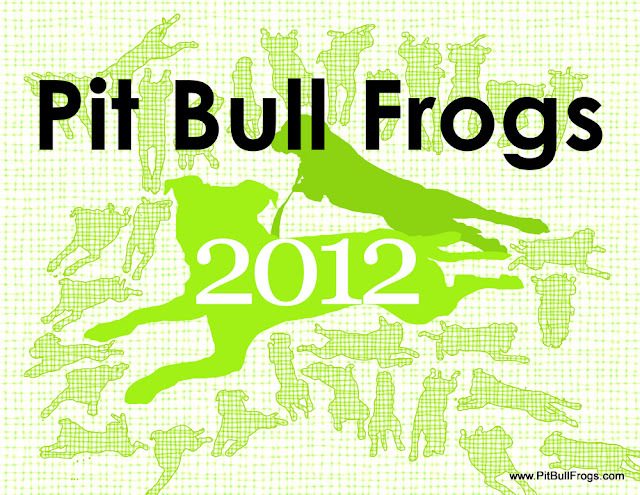 in the Pit Bull Frogs 2012 Calendar. For the Houston Pittie Pack ~ Our thoughts are with you . . . Thanks to Mayzie Gal for setting up a Chip-In Page to help Sandra and her family during this devastating loss and for keeping us updated. Please stop by Sandra's blog and let her know you're thinking of her and her family. 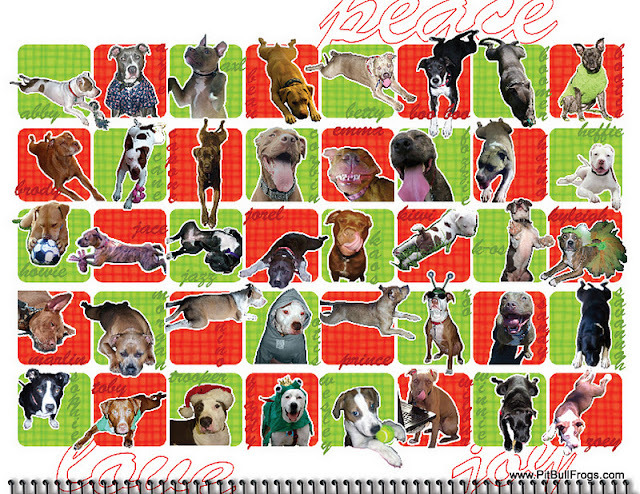 Our friends at Dog Tipper are hosting a Pit Bull Frogs Calendar giveaway! One lucky winner will receive their very own *F*R*E*E* copy of the 2012 calendar to drool over! Hop on over and find out how to enter this fab giveaway before Wednesday, December 21. Already ordered your copy? WIN another to give away to a furiend! And don't forget to tell all your furiends to enter, too! Here's a little sneak preview of a portion the January calendar page! You should see the WHOLE page! And while you're over at Dog Tipper, check out all their other awesome giveaways! We'll bet you find something for efurrybody on your gift list! Thanks Dog Tipper!!! CALENDARS HAVE ARRIVED AND ARE READY TO SHIP! The moment you've all been waiting for ~ Pit Bull Frog Calendars have arrived and are ready to ship! 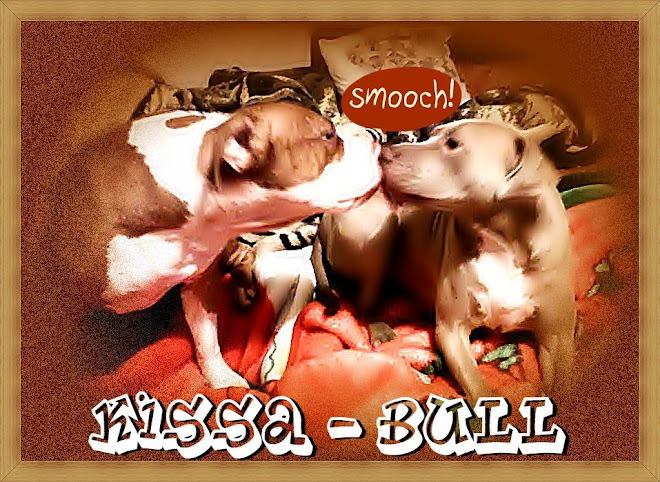 Great gifts for all your Pittie-loving friends! Proceeds to benefit pro-Pit Bull organizations. 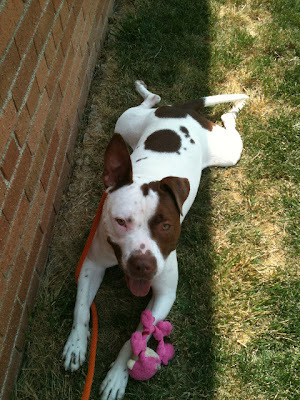 Want the proceeds of your purchase to go your favorite Pit Bull organization? Tell us about it when you checkout! The December 2012 Calendar page features all 40, count 'em 40, Pitties that submitted photos for our calendar project! We took some liberties with the December page and used a few non-frog pose photos to spice things up a bit. Bet you want your very own Pit Bull Frogs 2012 Calendar now, don't you? 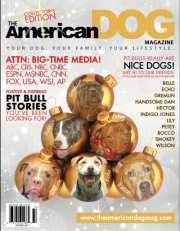 Proceeds from sales of the calendar will benefit various non-profit organizations like Bad Rap, Stubby Dog and Hello Bully to name a few, who work hard to help Pitties in many different ways, including the promotion of the positive image of Pit Bull-type breeds so that negative stereotypes and discrimination like BSL will soon become a thing of the past. When you purchase a Pit Bull Frogs Calendar, you can direct the proceeds to the pro-Pit Bull non-profit organization of your choice when you checkout through Paypal. Simply click the "ADD" button next to the words "Tell us your favorite pit bull charity" in the address box and fill in your choice. If you have questions, check out our Purchase Calendar FAQ. If you still have questions, feel free to send us an email.